Strainers are fitted in many piping lines to prevent the passage of grit, scale, dirt, and other foreign matter, which could obstruct pump suction valves, throttle valves, or other machinery parts. 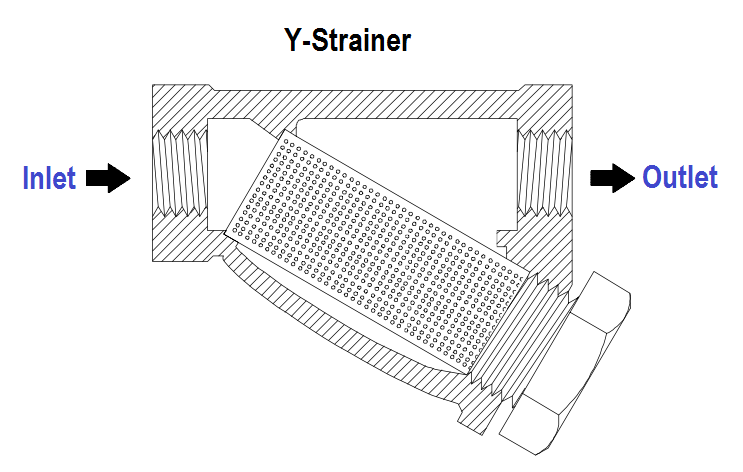 One of the simplest and most common types of strainers found in piping systems is the Y-strainer, which is illustrated in Figure 1. Figure 2 illustrates three additional common types of strainers. Part A shows a typical sump pump suction bucket strainer located in the sump pump suction line between the suction manifold and the pump. Any debris that enters the piping is collected in the strainer basket. The basket can be removed for cleaning by loosening the strongback screws, removing the cover, and lifting the basket out by its handle. Part B of Figure 2 shows a duplex oil strainer commonly used in fuel oil and lubricating oil lines, where it is essential to maintain an uninterrupted flow of oil. The flow may be diverted from one basket to the other, while one is being cleaned. 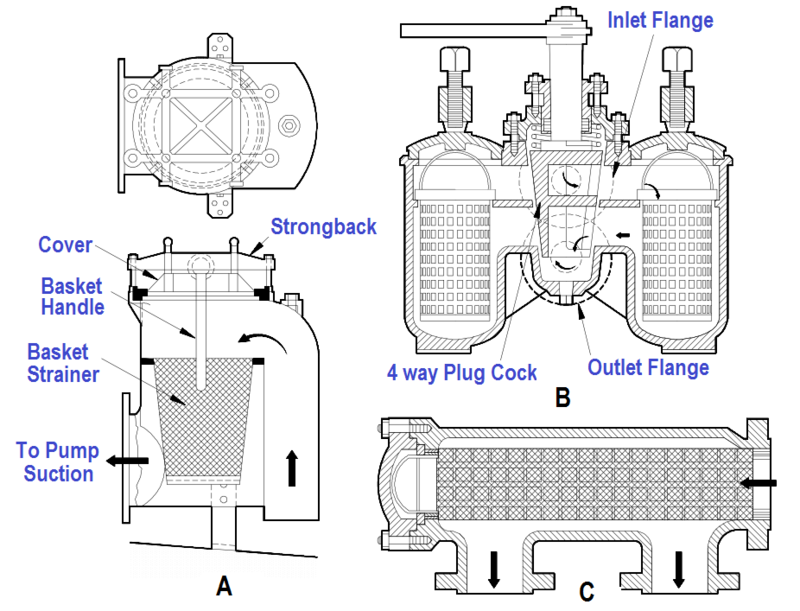 Part C of Figure 2 shows a manifold steam strainer. This type of strainer is desirable where space is limited, because it eliminates the use of separate strainers and their fittings. The cover is located so that the strainer basket can be removed for cleaning. What is Wellhead Control Panel ? What is Lift Check Valve ?